What is my meniscus? Do I need surgery if I tear my meniscus? The meniscus is a structure in our knee joint that provides smooth joint motion, shock absorption, joint stability, and nutrition to our knee joint. 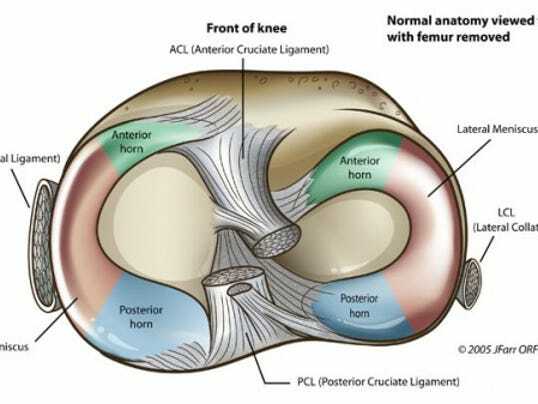 Each knee has a medial meniscus and a lateral meniscus. Together the medial and lateral menisci also enhance stability of the knee joint. They sit on top of our tibia (shin bone) and create a concave surface for the end of the femur to fit into, think of a golf ball on top of a tee - the menisci are like to lip of the tee that keep the ball in place. As you can see below the medial meniscus is larger and half circle shape and the lateral meniscus is smaller and more circular. The medial meniscus is more firmly attached to the surface of the tibia by ligaments compared to the lateral meniscus. The decreased mobility of the medial meniscus makes it more susceptible to injury. Both menisci receive blood flow to the outer edges however further towards the center of the knee joint the blood flow becomes poor. This is an important point as any meniscal injury on the outer edge with good blood flow is more likely to heal than an injury on the inner edge with poor blood flow. The portion of the meniscus that does not receive good blood flow receives its nutrition through the lubricating fluid in the joint called synovial fluid. Movement and exercise are essential to deliver nutrition to the menisci. There are also nerve endings that run to each meniscus. Some of these nerve endings provide sensation and others are mechanoreceptors that tell out brain how much pressure is on our knee and what position our knee is in. Meniscal tears are a common injury. They can be traumatic - like twisting a knee during a sport. They can also be non-traumatic or degenerative meaning that over time the meniscus starts to get worn out. Clinical examination including a detailed history and physical exam by a physician or physical therapist can be very accurate at identifying a meniscus problem. Sometimes an MRI may be done to visualize a tear and identify the size, type, and location of the tear. When a diagnosis of a meniscus tear is made there are options for treatment. Two common options are arthroscopic surgery or conservative management. Over the past 20 years the use of arthroscopic surgery to treat meniscal tears has expanded significantly. Specifically in the case of adults with degenerative (non-traumatic tears) the rates of surgery have gone through the roof. Unfortunately many studies have identified little to no advantage to this type of surgery for treating these types of meniscus tears. Conservative management, including exercise, is much less expensive and invasive and has no negative side effects has been shown to be better or equally as effective as surgery in some studies! Here at Performance Physical Therapy & Sports Conditioning we specialize in treating pain, identifying problem areas to address, and designing an individualized treatment plan to address those problem areas. In the case of a meniscus tear, strength, flexibility, balance, joint mobility, and function are all thoroughly assessed. A combination of mobility exercises, strengthening exercises, and manual therapy can be customized to treat a meniscus tear effectively and efficiently. If you are having knee pain or have been diagnosed with a meniscus tear, give us a call! Don’t rush out and have an arthroscopic meniscectomy if you have not seen us first. Based on the latest science conservative management with manual therapy and exercise should be the first line treatment for meniscal tears and surgery should be the last resort. Next week Gerry from Challenger Strength will discuss his approach to starting a strength training program with a client who has been discharged from physical therapy following a knee injury or surgery. 1.Fox AJ, Bedi A, Rodeo SA. The basic science of human knee menisci: structure, composition, and function. Sports Health. 2012 Jul;4(4):340-51. 2.Muheim LLS, Senn O, Früh M, Reich O, Rosemann T, Neuner-Jehle SM.Inappropriate use of arthroscopic meniscal surgery in degenerative knee disease. 3Azam M, Shenoy R. The Role of Arthroscopic Partial Meniscectomy in the Management of Degenerative Meniscus Tears: A Review of the Recent Literature. Open Orthop J. 2016 Dec 30;10:797-804.
in middle aged patients: randomised controlled trial with two year follow-up. 20. Review. PubMed PMID: 27129638.